I hardly have to proclaim my love for pearls, but lately I'm crushing on keshis. I can't get enough of their intense lustre and gorgeous colours. The keshi–"poppy seed" in Japanese– is (usually) a byproduct of the culturing process, or as my jeweler prefers to say, "a gift from nature". The oyster is busy making a cultured pearl, but rejects the nucleus (a bead or piece of tissue) before the process is complete. Because keshis have no nucleus, they are never round, and are also all-nacre. You will hurt an oyster's feelings by calling a keshi "pearl hurl". 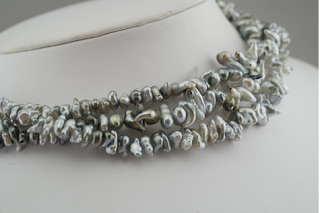 There is some leeway about the term keshi in the industry– a bunfight about whether the term can be used for freshwater pearls too, but in North America, most jewelers and designers have adopted the term keshi for any non-nucleated pearl, regardless of oyster variety. I'm linking to Kojima Company's owner, Sarah Canizzaro, who succinctly discusses the matter here. Some jewelers are ignorant about pearls even though they work with them; I've had them present keshi pearls to me as "baroque". 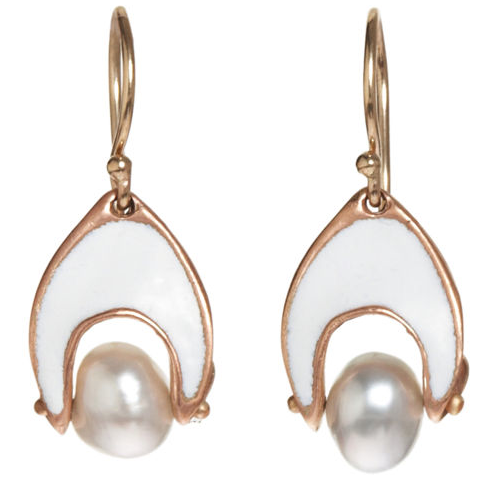 Baroque refers to the shape of a cultured pearl. Keshi is a pearl variety; its shape can be flattish (resembling cornflakes or petals), long and pointy (like pearl barbed-wire) or bumpily oval. Nor are keshis natural pearls, because they are created during the culturing process. The colour is usually natural (and if not, should be disclosed). A knowledgeable jeweler or vendor will also state the type of pearl, such as Akoya keshi or Tahitian keshi. The "Main Most Important Point" as my beloved dance teacher Louis used to say, is that good keshis are beautiful. And oh, do I have some keshis to show you! Tiny Akoya keshis and big (10.5-12.5mm) pink Chinese freshwaters paired in an elegant 45-inch rope. Expect someone to tell you they didn't know pearls could look like that. From Kojima Company; price, $900. You're not supposed to mix pearls and chain, but here's the beauty of Kate Hines' cool Chelsea Necklace: all-nacre keshis are not going to wear away to the nucleus when nestled next to chain. So, rocker chick, you can have it both ways. 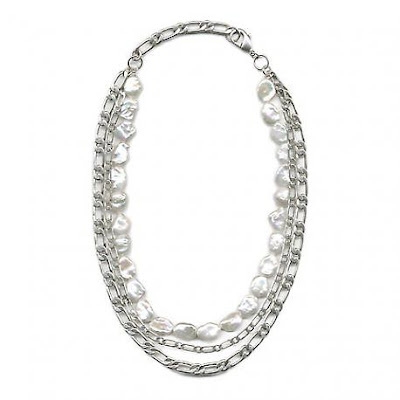 Keshis and sliver-finish (on brass) chain; length 20 inches; price, $160. 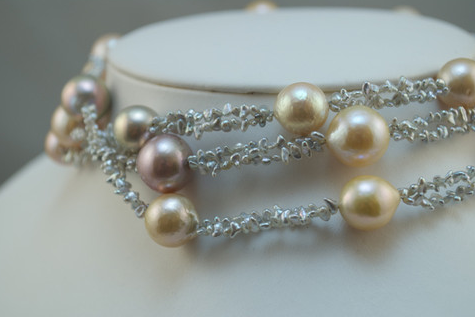 Also from Kojima, stacked keshis, a lavish span in a natural palette of silver, lavender, pink and cream. These flat keshis are drilled through the centre, so there are a lot of pearls in a strand. This necklace is 18 inches; the price, $490, also from Kojima Company. I visited a carriage-trade jeweler who displayed a strand of 10mm Tahitian keshis, and though the matching and lustre were remarkable, the price was too: $25,000. 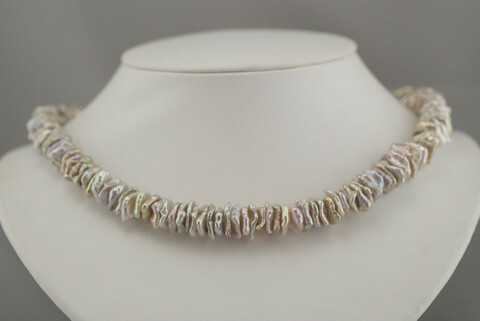 So, while $1,875 for this Tahitian triple strand (from Kojima Company) may seem steep, it is not, given the quality. Three 16" layered strands finished with a 14k clasp; total length, 17". A refined, unusual piece. Here's a 19-inch strand of big metallic keshis (about 15mmx12mm) which Etsy seller thewater's edge says are platinum grey in direct sun, and show these flashing hues in indirect light, so, enchanting either way. Finished with a sterling shepherd's hook; price, $180. She has also made this pretty sterling silver, 9mm salmon pink freshwater pearl and keshi necklace; only $35, it would be a sweet gift to a new graduate. 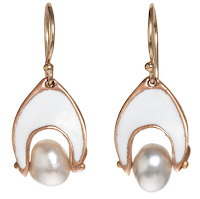 A pair of keshi earrings is a good way to audition the type if they are new to your jewel box. Long a fan of Ten Thousand Things, I can see wearing the Arabesque Earrings everywhere. Price, $610 at Barney's. A simple pair of 8mm-8.5mm Japanese keshi studs (on 14k yellow gold posts): the Zen earring, serene and lustrous. Price, $193 from Ikeda Pearls. 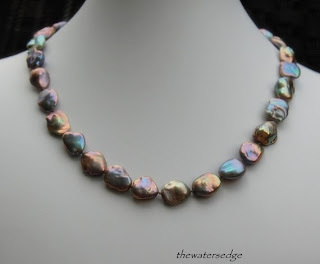 The nacre, the essence of refracted light that gives depth and the play of colour to a pearl, is remarkable on a keshi. I am always drawn to them, and can't we use all the glow we can get? They are gorgeous. Wish I knew who designed or stocked them in the uk. 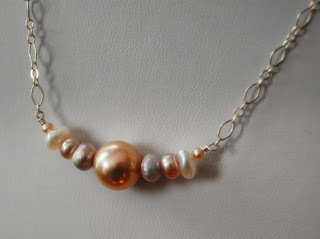 I love pearls with a modern unusual design. Gorgeous, all. But that metallic keshi necklace is really something spectacular! chicatanyage: Most vendors will ship to you, and have generous return policies. Why not order? pseu: Am always hoping to show that genuine pearls are in fact a far better buy than fake. 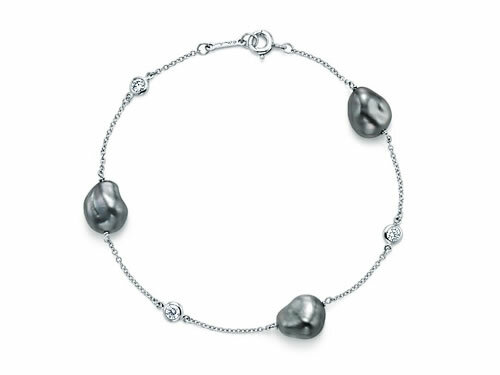 Of course the spectacular South Seas are fabulous too, but most of us want pearls for everyday, travel or casual occasions. I always look forward to your pearl posts. OOh, between you and Lisa, I'm getting my happy fill of pretties this morning. Love that metallic keshi necklace, the one with just a few interestingly pastel-coloured keshis at the centre. Charming! Ooh, pretties! Those arabesque earrings are really lovely. frugal: Thank you, I enjoy writing them. materfamilias: Chosen specifically to support my "real pearls need not cost the earth" platform. Mardel: I can see you in those. I love these! And I love working with Sarah who is a pleasure to deal with. I agree with you about wearing real pearls. As you have pointed out, those with more classic tastes can find lovely and well-priced items at Pearl Paradise. No need to wear fakes!! I'm going to be extremely envious of whomever snaps up that 45" rope from Kojima. I've seen it in person, and it's gorge! I have a difficult relationship with pearls. I love them on others, but always find them somehow "aging" or not quite "me", when I put them on. I've tried so many variations, even funky ones with leather. But, I do love them......as things. Such great stuff, especially for women of a certain age, it seems to me. I don't know why. N.S. I will not allow posts that promote jewelery without the person asking permission first.